If you're like most people in Milwaukie, OR, you want your brakes to work the moment you step foot on the pedal. That's why at Honest One Auto Care, we take pride in providing top-notch automotive brake repair services at an affordable rate. Our goal is to help each of our valued customers have the highest level of confidence possible when it comes to the functionality of their vehicle. 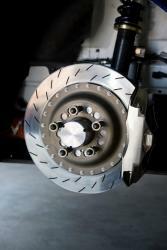 If you're looking for a reliable resource for automotive brake repair services in Milwaukie, you've come to the right place. Call Honest One Auto Care to learn more about our services and specials or to schedule an estimate for your vehicle today.